Contemporary and desirable touches can be found throughout each home at North Park at Eagle's Landing. Our one, two and three bedroom apartments for rent in Stockbridge, GA, include kitchens that are fully equipped with energy-efficient appliances and plenty of cabinet and counter space. Spend time outdoors from the privacy of your own home with large balconies and patios available depending on availability. Spacious bathrooms feature garden tubs, allowing you to relax in comfort and style. Many of the bedrooms at North Park at Eagle's Landing include walk-in closets, which make sharing easy. Browse our photo gallery to get a better idea of how these features and amenities will look when you call North Park at Eagle's Landing home. Enjoy an elevated lifestyle when you call North Park at Eagle's Landing home. A beautifully maintained landscaped setting welcomes you home with apartments in a wooded, natural setting. You’ll love coming home to mature trees and spectacular green spaces. 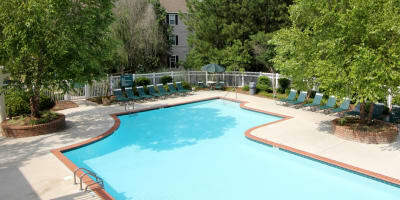 Spend time in the community at the resort-style swimming pool, which also features an outdoor grilling area. Health and wellness fit perfectly into your lifestyle at North Park at Eagle's Landing, because you can cut that costly gym membership fee you pay each month when you choose to work out at our community fitness center. We’re a pet-friendly apartment community in Stockbridge, which makes us the perfect place for you and your furry friend to call home. Get in touch with our professional leasing team today to schedule a tour of the elegant apartments for rent at North Park at Eagle's Landing.